Stewart Johnson of Kendric Vineyards held an open house at his winery on Treasure Island in San Francisco Bay in late April, with a tasting of his own wines as well as those of his two custom crush clients, Purity Wines and Thee & Thou Wines. I’ve visited Stewart several times in the past, including a 2010 excursion to his small vineyard in northern Marin County. Kendric Vineyards is in a spot that’s somewhat protected from the cold Pacific winds that make Marin one of the coolest winegrape-growing regions in California. Stewart planted the 8½-acre vineyard in 2002 – both the vineyard and winery are named in tribute to his late father. The vineyard is on an eastward-facing slope, and is planted to seven clones of Pinot Noir plus a small block of Viognier. His family owns a vineyard in Amador County’s Shenandoah Valley – Reward Ranch – that he helped plant with Sangiovese in 1994 and with Syrah in 2001. 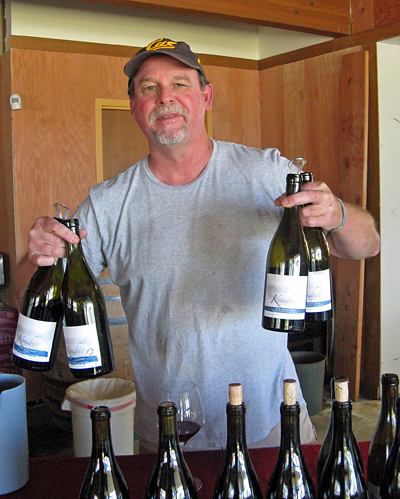 Stewart has made small lots of those two varieties from Amador as well as Pinot Noir and Viognier from his Marin vineyard. Stewart told me at the open house that he’s grafting some Chardonnay and Syrah at the Marin site, and he hopes to have his first commercial crop from those varieties next year. Kendric’s first commercial release was Pinot Noir from the 2004 vintage, and annual production is small, around 1,000-1,200 cases. Stewart’s facility on Treasure Island isn’t the most obvious space for a winery – formerly part of a school, the ceilings aren’t particularly high and there are lots of windows – but after some simple modifications, he’s made it work surprisingly well. There’s no tasting room as yet, but Stewart said he’s hoping to get one operating there in the future. I’ve helped Stewart bottle some of his wines over the past couple of years, something I do for a number of small wineries in San Francisco and the East Bay. Even though Stewart’s winery space is not large, he has enough room to host a couple of small producers who also make their wines there. Both Purity Wines and Thee & Thou Wines are newer ventures whose winemakers follow the path that’s been called natural winemaking. These wines are made without cultured yeast or malolactic bacteria, and without any additions of acid, water, enzymes, nutrients, etc. other than minimal amounts of SO2 to help protect the wine. It’s considered by many to be a riskier way to make wine than using more “conventional” methods, though at their best, these wines can be particularly compelling. Kendric 2014 Viognier, Marin County. Light straw color, this showed a little spritz at first from trapped CO2 that settled down in the glass. Bright citrus and spice aromas with a slightly reductive note. Medium-light weight on the palate with a lively texture. Kendric 2014 Gewürztraminer, Begin Vineyard, Carneros, Sonoma County. Light color with subtle lychee and spice on the nose. Not as fruit-forward as many California Gewürztraminers but lively and pleasant, finishing with a slightly chalky note. Kendric 2007 Pinot Noir, Marin County. Light garnet color, this featured some spice and oak upfront, along with upfront cherry fruit. Medium-bodied with a fairly smooth texture and finish. Kendric 2008 Pinot Noir, Marin County. Slightly lighter color, displaying pretty floral aromas, bright cranberry and strawberry fruit with some tea leaf notes. Medium-light weight with a lively mouthfeel and a clean finish, drinking nicely right now. Kendric 2009 Pinot Noir, Marin County. Light garnet color, with more subdued fruit and more savory and earthy character, plus a stony mineral component. More structured in the mouth than the two previous wines, but with refined tannins on the finish, this is attractive now and should continue to age well. Kendric 2010 Pinot Noir, Marin County. Lighter color, this showed more high-toned black cherry fruit, spice, and a touch of oak. Medium-light weight with good acidity but a slightly short finish. Kendric 2013 Pinot Noir, Marin County. Medium-light color, featuring savory and minerally aromas along with bright cherry fruit and a tea leaf note. The most structured of the Pinots, with lively acidity and fine tannins on a long finish – still young but showing nicely. Kendric 2012 Pinot Noir, “Reserve,” Marin County. Aged in 50% new oak. Medium-light ruby color, this had savory and earthy aromas, ripe cherry fruit, and a well-integrated oak component. Richer mouthfeel than the previous wine with rounder tannins – another wine that deserves more time in the bottle. Thee & Thou 2013 “Thee & Thou,” California. 43% Syrah, 43% Merlot, 14% Cinsault, sourced from Bechthold and Terra Alta vineyards. Medium color, with Merlot-like aromas, fairly ripe black cherry fruit, earth, herbs, and a stony mineral note. Medium-bodied with a lively texture and moderate tannins, quite pleasant. Thee & Thou 2011 “Thee & Thou,” California. 75% Merlot, 25% Cabernet Sauvignon, sourced from the Oregon House area of the Sierra Foothills. Medium purple, this had less-ripe cherry and plum fruit, earth, plus a somewhat funky, leathery component. More structured in the mouth than the previous wine, with a grippy tannic finish that will take a few years to smooth out. Purity 2015 Pinot Gris, Underwood Vineyard, Sierra Foothills (pre-release). Medium-light color, this had pear fruit and herbal, savory aromas. More texture than expected on the palate with a touch of tannin on the finish. I would have guessed this had some skin contact during fermentation but it did not – an intriguing young wine. Purity 2015 Mourvèdre, Silvaspoons Vineyard, Lodi (pre-release). Medium-light purple, featuring bright black cherry, earth, and herbs on the nose. Bright and lively mouthfeel with moderate tannins on the finish, this should be an appealing wine for early drinking. Purity 2015 Barbera, Silvaspoons Vineyard, Lodi (pre-release). Slightly darker color, with a darker fruit profile, herbs, and vibrant acidity. Medium weight on the palate, this showed moderately chewy tannins on the finish. Purity 2014 Cinsault-Grenache, California. Lighter in color, this had some funky, earthy aromas upfront followed by black cherry and wild berry fruit, dried herbs, and a touch of spice. Bigger texture with chalky tannins. Purity 2014 Syrah, Demetria Vineyard, Santa Ynez Valley. Medium-dark purple, displaying savory, spicy, and floral scents plus both red and black fruit. Medium-bodied with a lively mouthfeel, finishing with moderate tannins – showing very nicely right now and has the potential to age well. 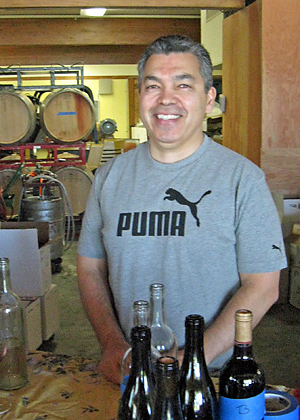 Purity Wines is the project of Noel Diaz, whose background is in the restaurant business. John Donoghue is the owner/winemaker of Thee & Thou Wines. John has worked with a few vintners, most notably Gideon Bienstock of Clos Saron in the northern Sierra Foothills. I’d tasted some of the Purity and Thee & Thou wines at a recent wine event in Oakland and liked several of their wines, so I was looking forward to checking them out again. There were a few people already tasting when I arrived at the open house in the late morning. There was a long table set up and each of the three vintners was behind it to pour their wines. I started with Stewart’s Kendric wines, all of which except the Gewürztraminer were sourced from his estate Marin County vineyard. He had quite a few bottles open to taste, and I began with two whites, a 2014 estate Viognier and a 2014 Gewürztraminer from a cool site in the Sonoma Carneros region – the Gewürz is Kendric’s first release of that variety. The Viognier was a bit rounder than the previous vintage, and I enjoyed the dry Gewürztraminer though it may not be everyone’s style. I moved on to some Kendric library wines – Pinot Noirs from the 2007 to 2010 vintages. Stewart noted that he started fermenting his Pinot with anywhere from 67% to 100% whole clusters starting in 2007. I liked the 2008 and 2009 best, though they were quite different from one another, with the 2008 being light and floral while the 2009 was more structured, with savory and stony mineral notes. The two current Pinot bottlings concluded my tasting of the Kendric wines – the 2013 and the 2012 “Reserve.” The 2012 was sourced from a part of the vineyard with shallower soil and a lighter crop load, and aged in 50% new French oak. These last two wines showed the savory side of Stewart’s Pinots – the 2013 reminded me of the 2009 while the 2012 was a bit bolder. Both were promising young wines that should age nicely. Finally, I moved on to the Thee & Thou wines. John poured a couple of his bottlings, beginning with the current 2013 release. This is a blend of Syrah and Merlot from Markus Bokisch’s Terra Alta Vineyard plus some old-vine Cinsault from Bechthold Vineyard. Both vineyards are in the Lodi area and farmed organically. The fruit was co-fermented, with foot-stomped whole clusters, and aged in neutral oak for eight months. The as-yet unreleased 2011 is a blend of Merlot and Cabernet from the Oregon House area, where Clos Saron is located. John told me that the fruit in that particularly cool vintage was picked in mid-September at only 20.5 brix, then entirely destemmed for fermentation, and aged in neutral oak for 18 months. The two wines were quite different from one another – not surprising given the different vintages and blends – and the 2013 was my favorite of the two. John said that he’s currently working on a Syrah/Grenache blend from biodynamically-farmed Demetria Vineyard in Santa Ynez Valley as well as a Tempranillo/Grenache/Graciano blend from Lodi. Noel was pouring his Purity wines at the far end of the long table. He started me out with a pre-release sample of 2015 Pinot Gris, with fruit sourced from Underwood Vineyard in the Penn Valley region of the Sierra Foothills near the small town of Rough and Ready and not far from Grass Valley. This was a distinctive wine that could be mistaken for a skin-contact Pinot Gris even though it was not. Next was a 2015 Mourvèdre from Silvaspoons Vineyard in Lodi, aged in neutral oak. I moved on to a 2015 Barbera from Silvaspoons and then a 2014 blend of whole-cluster fermented Cinsault from Silvaspoons and Grenache from Demetria Vineyard in Santa Ynez Valley. Noel’s final wine was a 2014 Syrah from Demetria Vineyard, also fermented with whole clusters, and aged in neutral oak for 12 months. I thought the Mourvèdre and Syrah were the standouts among these wines, and I enjoyed the Pinot Gris as well. 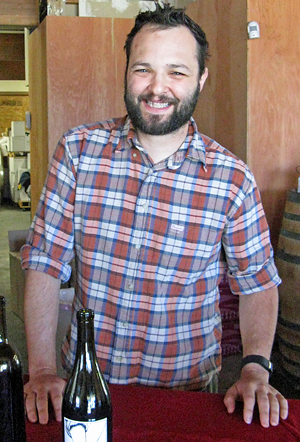 Noel has also made Marsanne, Roussanne, Grenache Rosé (I tasted this at the earlier Oakland event and it was very nice), Carignan, Grenache, a Cinsault/Carignan blend, and several other Syrah bottlings from vineyard locations ranging from the Sierra Foothills to Russian River Valley. Noel also makes pétillant-naturel (or “pét-nat”) sparkling versions of Marsanne and Pinot Gris, bottled under crown cap. This was a fun tasting, with three very different styles of wine presented. I’ve followed Stewart’s Kendric wines for awhile, and he’s one of the best vintners working with Marin County fruit. His two most recent Pinot bottlings are among the best he’s made, while some of the older ones showed how well his Pinots can age. Both John and Noel show the enthusiasm of vintners who are still in the early stages of their work. The current 2013 Thee & Thou release shows the potential of what John can do with his winemaking efforts, and I’m looking forward to trying his upcoming wines. Noel’s wines strike me as a bit more edgy than either Stewart’s or John’s – he’s trying some interesting approaches with his winemaking. 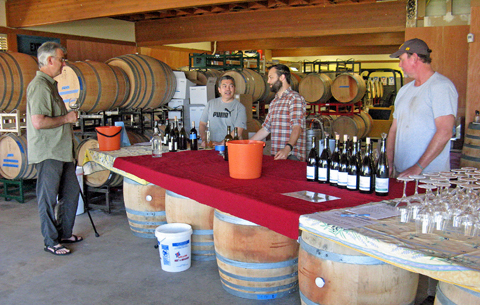 His wines show plenty of character – my favorites were the Mourvèdre and Syrah, and the Pinot Gris was quite intriguing. I should note that Stewart is also always looking for new things to do with his wines, from increasing the whole-cluster fermentation on his Pinots to skin contact on his Viogniers – he’s not one to stand still with either his farming or winemaking. If you’re able to head to Treasure Island for a future Kendric open house or just make an appointment to visit these vintners, I certainly recommend it.